Resumes are living documents. Our resumes allow us the opportunity to tell our professional story; who we are and the various experiences that make us uniquely qualified for a particular job; they are our preliminary introduction to potential employers. Therefore, cultivating your resume is arguably the most vital part of the interview process. That is to say, on one page, we must accurately convey our expertise, trainability, and relevant experience. There are, of course, many obvious things to include on your resume: name, contact information, dates of employment history, job description, etc. Moreover, there are also items that have no necessity at all. 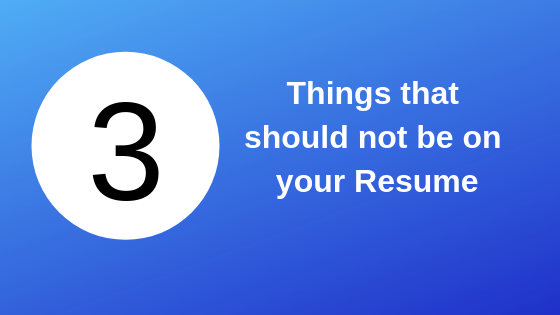 The following is a list of 3 things to consider eliminating from your resume. Jobs from high school and college. As a general rule of thumb, avoid highlighting side jobs that you held throughout the pursuit of your education. With few exceptions, this experience is dated and irrelevant to the positions you are currently applying for. Unless it is your first job and your employment history makes up most of your work experience or the topic is extremely relevant, leave the side gigs exactly there: to the side. Objective statements. Objectives were originally designed to succinctly articulate your professional interests, particularly when seeking out a specific position at a specific organization. Today, in a time when online job postings dictate a majority of applications, it is actually counterintuitive to constantly modify your resume for one sentence. Specific interests, job titles and company names can be tweaked within your corresponding CV to each potential employer. Save room on your resume for descriptive action verbs about relative work experience. Weblinks. While many companies and organizations utilize digital means to obtain and review resumes, oftentimes the viewer is unlikely to relink to another site. Linking to social media or online portfolios are a waste of space on a resume and should serve as follow up items in your correspondence. That is, it is best to share links to online portfolios after or doing your vetting process, should the employer express interest. While it is important to keep in mind what to leave off of your resume — the following items are a few points we encourage you to keep. Action-orientated verbs (are a great way to structure the content). When describing your work experience, using action verbs can help clearly articulate the roles you served and the skills required to perform specific tasks. For example, begin your statements with words like, “performed,” “supervised,” “managed,” or “coordinated” to describe your experience in previous positions. References. Typically, references are not cited directly on one’s resume and are usually provided only per request. However, sometimes is helpful to provide your references’ contact information ahead of time (or during the process of resume submission). It allows your potential employers the opportunity to vet your qualifications ahead of time, should they choose.